Stroll through the streets of Downtown Baraboo to see the shops ready for the Summer season. Visit the designated shops and taste wine, sample snacks, enjoy entertainment and do a little Spring shopping. 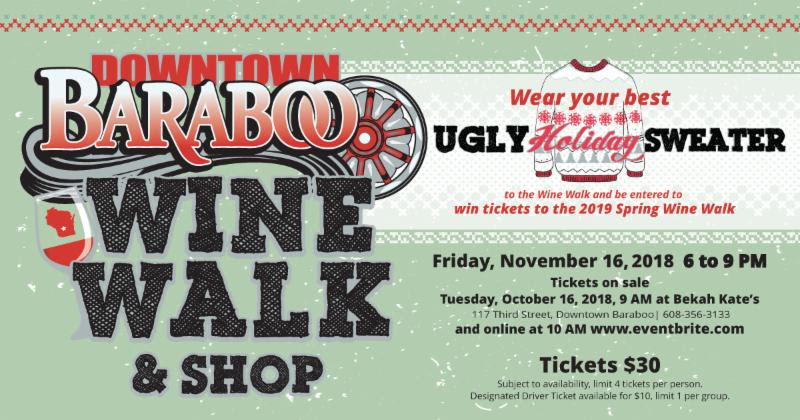 Downtown Baraboo hosts the Original Wisconsin Wine Walk, 2 times a year in May and November. Baraboo Bar Buddies will be offering round trip rides starting at 4pm on Friday, November 16th and running until after 2am. Please call them today and schedule your pick up. Make your reservations early, space is limited.